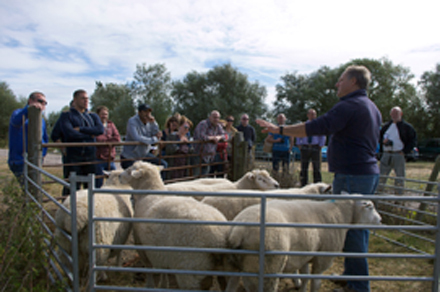 EBLEX kicked off its ‘Five Star Lamb Tour’ on a Quality Standard Mark Scheme approved farm in Kent. Catering butchers and chefs spent the day at Becket Farm House, where they were offered inspiration to help them put lamb back on the menu. Farmer Howard Bates with guests on the Lamb Tour. 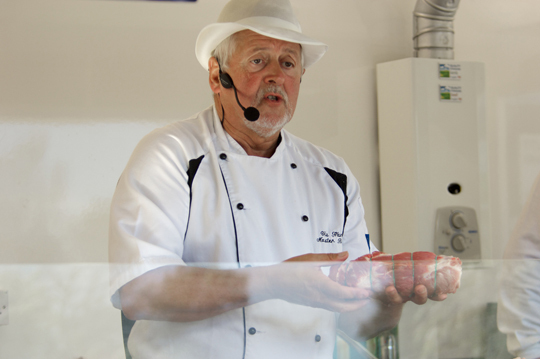 Viv Harvey was on hand to provide a butchery demonstration to the delegates. He added: “Most of your customers know about leg of lamb and lamb chops. But there is so much more to lamb – it’s a very versatile meat. Most chefs tend to focus on the loin and leg but you should also consider shoulder, as it produces some wonderfully tasty, good value cuts. Spatchcock Shoulder of lamb is ideal for menus and can be diamond scored and seasoned to take on more flavour. Another use of the shoulder is lamb Rib-Eye which can be nicely presented with good quality wooden skewers. The next stops are Nottinghamshire (9th October) and Lancashire (17th October). If you would like to attend one of these events, please email Laura Harrison at laura@nimblejack.co.uk or call Hugh Judd on 07966 083164. First BPEX champion title goes to The Black Quack!